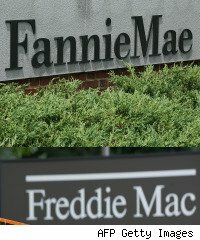 Fannie Mae's (FNH) report of a third-quarter loss of $19.76 billion and subsequent plea to the federal government for $15 billion in additional aid is sure to intensify a big question that so far has gone unanswered: What can be done to stem the bleeding at the giant mortgage lender and its sibling Freddie Mac (FRE)? Given this week's bankruptcy filing by CIT, which will probably lead to the loss of $2.3 billion in taxpayer money, Fannie Mae's request for another $15 billion will strike many as throwing more good money after bad. Fannie Mae had previously posted second-quarter losses of $14.8 billion, on top of $23.2 billion of red ink in the first quarter, leading Morningstar equity analyst Matthew Warren to write in a report: "Nothing fundamentally has changed with the situation at Fannie Mae, and we remain quite certain that the equity shares are worthless barring a ridiculous public policy decision on the part of the U.S. government." As Warren foreshadowed, all eyes will be on the Obama administration as Fannie Mae's situation gets even worse. The percentage of loans the company owns that are considered in serious delinquency rose to 4.72 percent from 3.94 percent last quarter and foreclosed property acquisitions have more than doubled to 98,428. In its quarterly report filed with the Securities and Exchange Commission this week, Fannie admitted: "We are dependent on the continued support of Treasury in order to continue operating our business." The lender has already used $44.9 billion of the $200 billion aid package it received when placed under conservatorship last year. Before much more of that money is used, Congress will undoubtedly ask what the administration's long-term plan for Fannie and Freddie is. The U.S. General Accounting Office released a report in September that explored options the government could take to deal with the problems at both enterprises. The report suggested turning Fannie and Freddie back into government-sponsored for-profit enterprises with major restrictions to minimize risk. This would "eliminate or reduce mortgage portfolios, establish executive compensation limits, or convert the enterprises from shareholder-owned corporations to associations owned by lenders," said the report. The GAO also suggested turning the mortgage companies into government agencies that would focus on purchasing qualifying mortgages and issuing mortgaged-backed securities, while eliminating their mortgage portfolios. A last possibility was to privatize or terminate them. "This option would abolish the enterprises in their current form and disperse mortgage lending and risk management throughout the private sector," the report said. Of course, there are many ways to terminate the two organizations -- each with pros and cons. Investment bank Keefe, Bruyette & Woods (KBW) is floating the option of recapitalizing both entities and restructuring them in a way that could give them an opportunity to become profitable again. "The only viable option to limit taxpayer expense and recapitalize Fannie Mae and Freddie Mac is to set up a Bad Fannie and Bad Freddie with the existing portfolios, and a new Fannie Mae and Freddie Mac as cooperatives of bank mortgage lenders, along the lines of the other GSEs -- the Federal Home Loan Banks," analysts Bose George, Frederick Cannon and Jade Rahmani write in an October report. KBW argues that banks that benefit from Fannie and Freddie guaranteed loans should pay for the privilege, giving the government an opportunity to eventually get out from under guaranteeing all of the loans. The ownership structure of Fannie and Freddie "should be shifted over time to a cooperative of banks similar to the Federal Home Loan Bank system. Under such an approach, the banks that originate an agency-conforming loan would be required to retain 5% of the loan balance as an equity investment in either Fannie Mae or Freddie Mac. Thus the new agencies would be recapitalized at a solid 5% level of the new expanded balance sheets under FAS 166/167. The capital would provide a significant buffer to bondholders in the new agencies from future losses," the report said. KBW said the returns on the stock investment in the newly created agencies would be modest, but any return would look pretty good for stocks that many analysts have been declared worthless. Like with the options offered by the GAO, KBW's approach also has pros and cons, but a restructuring of Fannie and Freddie seems likely at some point, given the accelerating pace of foreclosures and the slow rate of economic recovery. If Fannie's current aid request is approved, taxpayers will be on the hook for $60 billion and own hundreds of thousands of homes in a housing market where prices may not rise for years. The Obama administration can gamble on the recovery saving both entities, but cutting their losses might be the best bet for taxpayers.